After the great "it tastes like Christmas" debacle of the Cherry Quinoa Salad it would have been easy to give up. But I knew I wanted a fun salad for our Easter get together and I had quinoa on the brain. Fine, cherries and yogurt didn't scream spring to my husband. There had to be a magical combination that would! What could be more springy than fresh strawberries? The ones in the store finally have some flavor again and they don't cost a million bucks like the bland winter berries seem to. They would be perfect in my Easter salad! Some fresh basil would add that bright herby flavor too. I really would have loved to use a crumbly cheese like gorgonzola or feta, but I knew some of my guests would have a hard enough time making the quinoa leap and I didn't want to push them too far. So, mozzarella would fit the bill nicely. I used pistachios on top because I love the color and Matt actually ate them. Usually he won't eat anything with nuts, so I figured we would stick with what was working. Though I think pecans or walnuts would be great here too. In the end I finally had a quinoa salad that screamed spring! Cook quinoa according to package directions. Allow to cool, then chill in the refrigerator. 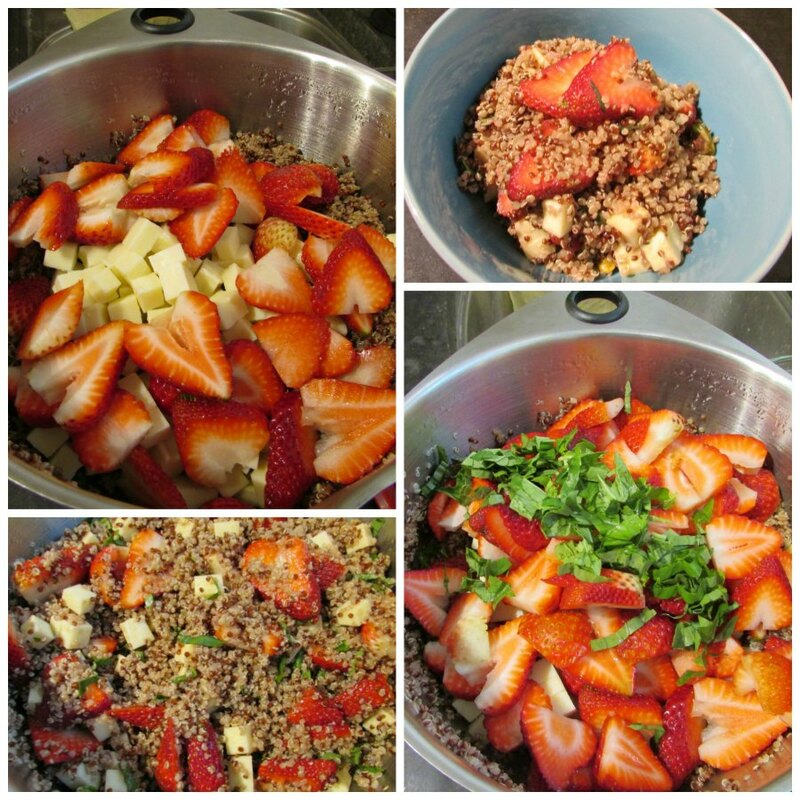 When ready to serve, toss chilled quinoa with strawberries, basil, and cheese. In a small bowl, mix together vinegar, oil and salt. Pour over quinoa mixture and stir to coat. Top with pistachios and serve cold or at room temperature. This salad sounds perfect for Spring! I've been trying to incorporate quinoa into my life too. I really do like it. The pistachios are an awesome addition! Thanks, Michele! I like it too, but I am always looking for fun new ways to eat it. Your Springtime Strawberry Quinoa Salad looks delicious,thanks so much for sharing with us at Full Plate Thursday! This sounds lovely! Finding quinoa recipes that my husband enjoys is somewhat challenging, and I know he'll like this one! I hope he loves it! My toddler doesn't like the texture, so he just picked out the berries. Thank you, we really enjoyed it! Oh I like this Carlee! I just made a Quinoa salad...you should see it soon! :-) I love the strawberries!! Thanks for sharing on My 2 Favorite Things on Thursday!! Hope to see you again tomorrow!! Pinned!! I can't wait to see what is in yours! Thanks! 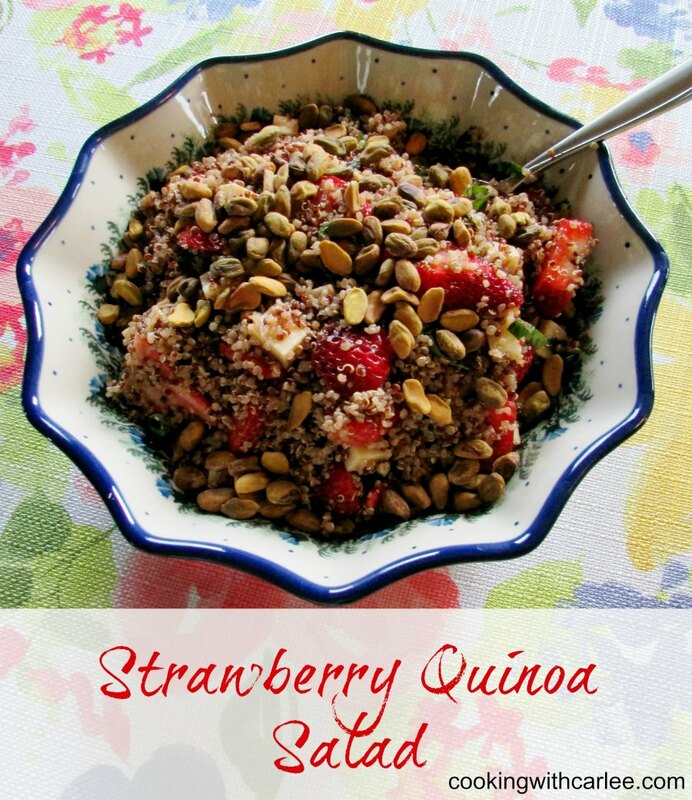 I love quinoa salads, this sounds like a wonderful combination! Thanks for sharing at What'd You Do This Weekend?! Thanks, Jess! I just shared it! 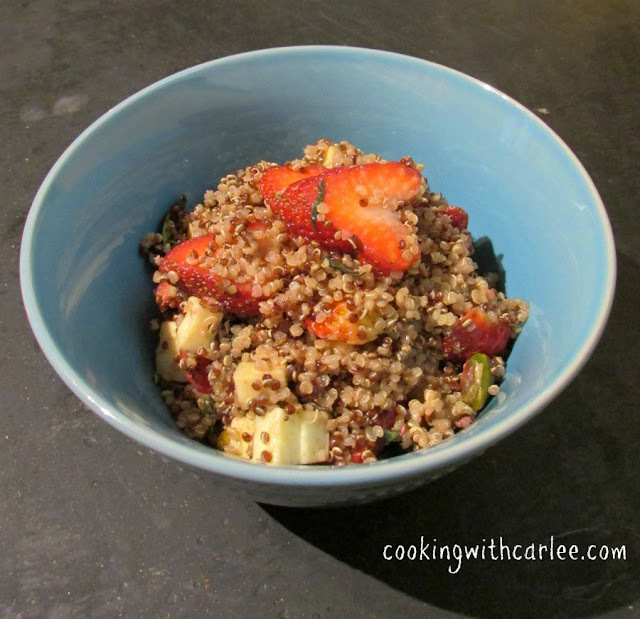 I would never have though to mix strawberries and quinoa! This looks so good! As soon as I can get strawberries again, I am going to try this out! Thanks for sharing at Merry Monday! I thought it would be a fun play on the caprese quinoa salad I made last summer. I can't wait for tomatoes to be decent again so I can make more of that too! I hope you love it! Carlee, I really still want to try the Cherry quinoa salad. But you are so right, this one just screams spring. Strawberries, basil, and fresh mozzarella! This is a treat for the taste buds. I will be trying this one also. I love the way you pair things together and your original creativity when creating recipes. So refreshing.